The stunning fur trim collars from WeLoveFurs are the highlights of all our Fur Parka Jacket range, transforming an everyday Parka Jacket into an absolute eye catcher. WeLoveFurs are striving to set the highest standards, and indulging in only the best quality real fur collars for our products. The ultimate glamorous touch. The bigger the better. That can certainly be said about our XXL fur collars products. All of the XXL fur collars for our Parka Jackets meet our minimum size requirements. With a minimum length of 92cm and a minimum diameter of 22cm they are at least twice as fluffy as any of our competitor's products. Glamour never felt or looked so good. The fur trims that are selected for our products undergo a very strict quality control process, ensuring that only the finest and best quality fur is used. It is of the upmost importance to us that the fur collars are of the highest quality and as large as possible, to create the most glamorous finish to our products. All fur collars are unique with their own natural characteristics. WeLoveFurs are so confident in the product that we sell that we offer a money back guarantee if you are dissatisfied with any of our furs. Down Jacket with Fur Hood "Majestic Black"
In our short down jacket with XXL fur collar you can survive the coldest of winters with warmth and style. It is very slim fitting, extravagant and irresistibly warm. Adorned with a fabulous contrasting GreenCollection XXL fur collar, that comes with our WeLoveFurs XXL Oversize & Quality guarantee. Super shiny, incredibly glamorous and very warm. You can appear glamorous on the iciest of winter days with our Puffer Jacket with Fur Hood ”IceBlack”. A combination of highly glossy black, super feminine design and maximum size XXL fur collar means that this jacket is mega extravagant. A more extravagant Puffer Coat with Fur Hood can’t be found. The combination of highly glossy black, slim cut, and maximum size XXL fur collar makes this Puffer Coat with Fur Hood an absolute glamour highlight. Super slim and super cosy all in one: you won’t find a more extravagant fur hooded jacket. It has a slim fitting and short cut in contrast to the extra large GreenCollection XXL fur collar. Despite the super slim fit, the fur hooded jacket has acosy removable inner lining, which guarantees you warmth throughout the winter. As there is no limit to glamour, we bring you our popular “Petite” parka, in a super-glamorous camouflage edition. The army inspired Camouflage Jacket with Fur comes in a very tailored fitting, tailored and short cut, which allows you to look slim on the coldest days. Our Fur Parka Jacket “Petite” is impressive with a very short and tailored fit, which makes it a uniquely feminine Parka. Equipped with a cosy inner lining, our Fur Parka will keep you completely warm on the coldest of days, but it will also allow you to look super slim and glamorous. Our long fur hooded down jacket with XXL sized Fur Collar is more than just a fashion statement. Lined with 80% high quality goose down, it will keep you amazingly warm on the coldest days. The jacket is highly tailored at the waist and has a close fitting. Down Jacket with Fur Hood "MajesticBlack"
Extremely warm, extremely slim and with extravagant silver fox fur. Our down jacket with fur “Majestic Black” is available for the first time with a magnificent XXL collar made of precious silver fox fur. Extremely warm, extremely slim and with extravagant silver fox fur. Our long down jacket with fur “Majestic Black” is available for the first time with a magnificent XXL collar made of precious silver fox fur. WeLoveFurs “Mini” parka has a slim fitted tailoring and is ideal for the WeLoveFurs petit customer. 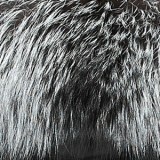 Finished off with an extravagant oversized XXL raccoon fur collar for an extra touch of glamour. Extremely warm, extremely slim and with extravagant silver fox fur. Our Fur Parka Jacket “Petite” is available for the first time with a magnificent XXL collar made of precious silver fox fur. Our Bomberjacket with Fur is a glamour highlightwith the best streetcredentials, which makes ordinary bomberjackets fade in comparison. The utmost highlight of the jacket are its magnificent XXL fur collars, which you can detach from the hood on warmer days.